Printing Magnetic Slgns for steel surfaces. Make the laws of attraction work for your business! Using our CNC Plotter/Router, we can cut your graphic(s) to custom sizes and if required, custom shapes. Our heavy-duty magnetic signage is perfect for sticking onto most metal surfaces and can be cut to whatever size and shape you need. 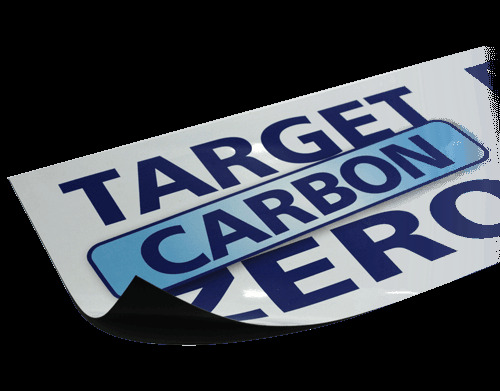 Perfect for temporary vehicle signage which you can use during work time then remove for evenings and weekends! And, unlike some, this won't blow off as soon as you do in excess of 20 miles per hour! Why choose Flexpress for magnetic signage? As you can input and order virtually any size up to 620mm in height, by 2400mm in length, we can't provide any templates for this product. However, please ensure all artwork supplied has atleast 3mm Bleed (if applicable), is in CMYK, and has crop marks and/or a cutting file (in the form of a vector line drawing) supplied with it. For artwork best practice and more information about artwork terminology, take a look at our Artwork and File Information page.